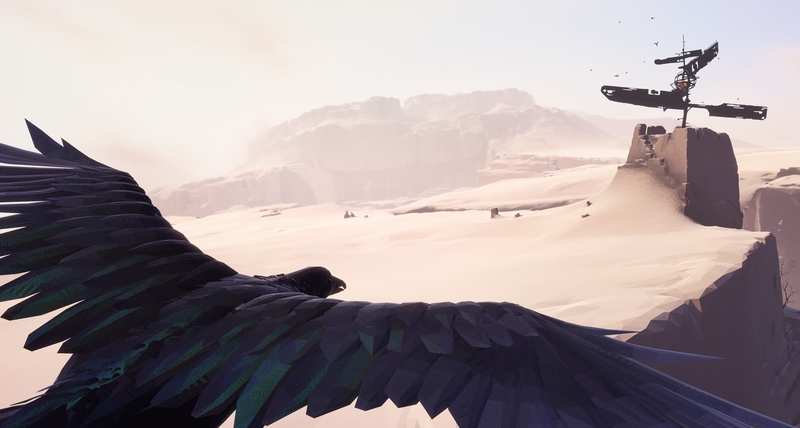 Vane is an exploration game where you play as a young kid that sometimes transforms into a bird. The trailers released since it was revealed in 2014 have each been beautiful, moody cinematic shorts unto themselves. It was supposed to be released last year, but wasn’t. And it might not come out this year, either, said the game’s producer Matt Smith. “We will probably be heads down in this thing next year as well,” Smith said during a Skype call last December. It’s getting closer, though. Vane was shown at PlayStation Experience that month and, so far, development studio Friend & Foe had found player feedback to be more positive than in years past. “That, to me, says that we’re making progress, and when you’re working on a game like this it can be very hard to feel like you’re making progress,” Smith said. Not everything has gone according to plan with Vane. The person who originally conceived of it, Shadow of the Colossus artist Rui Guerreiro, departed early on to go work on his own similar, VR-based project. The whole beginning section of the game, the first working portion the studio had put together, ended up being scrapped entirely in the ensuing months. In 2016, it made a high-profile appearance at PlayStation Experience 2016, after which Friend & Foe learned a tough lesson. Vane’s new trailer debuted on stage during the keynote that year. After two years of mostly silence, it offered a more detailed glimpse of the game that only presented more questions. Someone was carrying a crystal up some steps while a storm raged in the background, followed by a quick-cut montage of different evocative moments set to a brooding bass synthesizer. In just a minute the trailer finished, people cheered, and a 2017 release date flashed on screen. With hints of both Journey and Ico, Vane was the perfect kind of indie game to show off at a Sony event bookended by larger, more familiar AAA games. Demoing it on the show floor that year was a different story. Vane has the potential to be a lot of things, including one of those games you start playing for the first time and go, “This looks really cool...what am I supposed to be doing again?” Showing off the beginning chunk of the game and seeing attendees fumble through it ended up being a wake-up call for the development team. Demoing Vane at the show was, Smith said, a “tooth-grinding process where every time someone would play we’d have to point them somewhere pretty regularly.” Starting off in a big open desert, players could go off in whatever direction they wanted and just start exploring. This turned out to be more intimidating than anything else, Smith said. “We were hoping it would be inviting, that you would just sort of go out into that horizon, and it turns out that a lot of people got lost as a result,” he said. 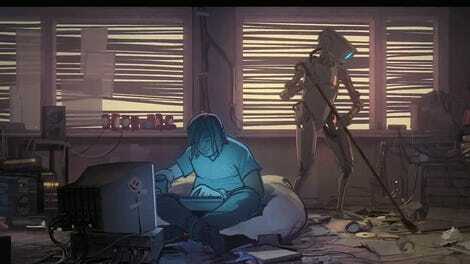 Smith felt that there was a disconnect between the creators’ vision and the people trying to play it, one that the studio even elaborated on in a sparse blog post after the fact. They were happy to see players say the game felt different and intriguing, but it wasn’t clear anything had been conveyed beyond its unique feel and mood. Finding the right balance between holding the player’s hand and letting them explore how a game works for themselves is a goal every game studio struggles with, but it can be especially make-or-break for something as abstract as Vane. It’s not something Smith thinks can be brute-forced by simply adding more developers. The game has no spoken dialogue and next to no text, which is one of Friend & Foe’s only hard and fast rules concerning Vane’s development. While the last few years have been filled with compromises, like cutting puzzles and crucial plot developments, that hasn’t been one of them. But it’s also part of why development is now being extended: They could address issues of complexity and the overwhelming openness of the game’s world with signposts and explicit directions, but that would fundamentally change what Vane is. “Putting a button image on something is very cheap,” said Smith. “Doing a very long building out of the right type of response and interactivity so that the player understands what their inputs are doing in the system is, a lot of times, very poorly defined and therefore quite expensive.” Communicating as much to the player as possible with as few prompts as possible is what Smith and the game’s director, Ivar Dahlberg, call the game’s high-flying goal. Whether they can achieve it in time before their water runs out remains to be seen. One way the team is trying to non-verbally guide players through the game is increasing the amount of contrast in the environment, so that key points of interest stand out more in the environment and entice the player to go explore them. Looking at The Legend of Zelda: Breath of the Wild, Smith and Dahlberg say they recognized similar challenges to what they’ve faced in making Vane. “We ran into the same things I imagine the Zelda developers did in terms of people losing interest or not being willing to tough out the longer road without something more interesting immediately in front of them,” said Smith. Friend & Foe now tries to signal new locations or puzzle areas, especially along the horizon, without overwhelming the player or leaving cookie-crumb trails of smaller potential interactions along the way. The slice of the game that Friend & Foe showed off at the most recent PlayStation Experience was more directed, showcasing the main protagonist’s transformation into a bird and back again. Players understood that mix of surveying the land as the latter and then exploring it on foot with much less coaching from the sidelines. Smith and Dahlberg now feel they’re honing in on a better balance overall, and are able to use this type of feedback to continue refining other areas in the game. Footage from this particular demo has made its way online and the results show a game that’s continuing to progress, even if that journey’s been slower going than expected. Currently the game has a tentative release date of 2018, but that’s not really on anyone’s mind at Friend & Foe.